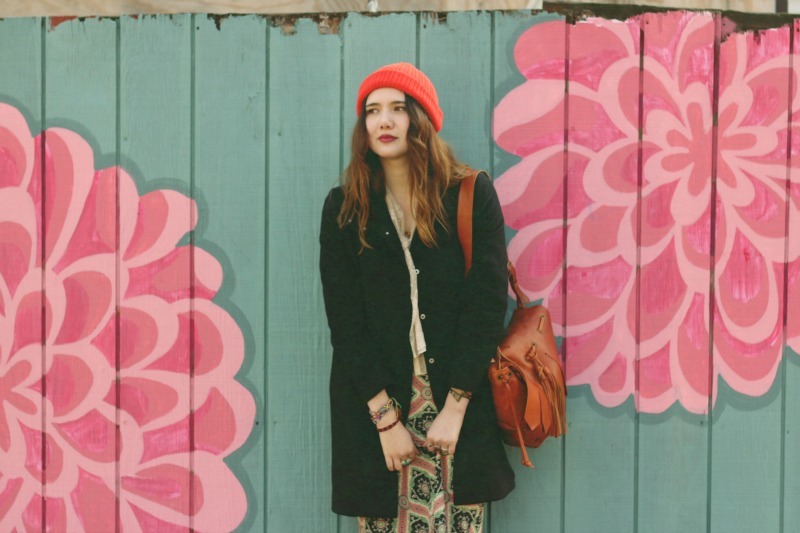 Vintage blouse and skirt, Banana Republic coat, Gap beanie, Natalie + Dylana Suarez x Modern Vice red Jett Boots and cognac Jett Messenger Bag! Always finding a reason to diddly daddly around my neighborhood in some red boots and my funky little sailor hat. 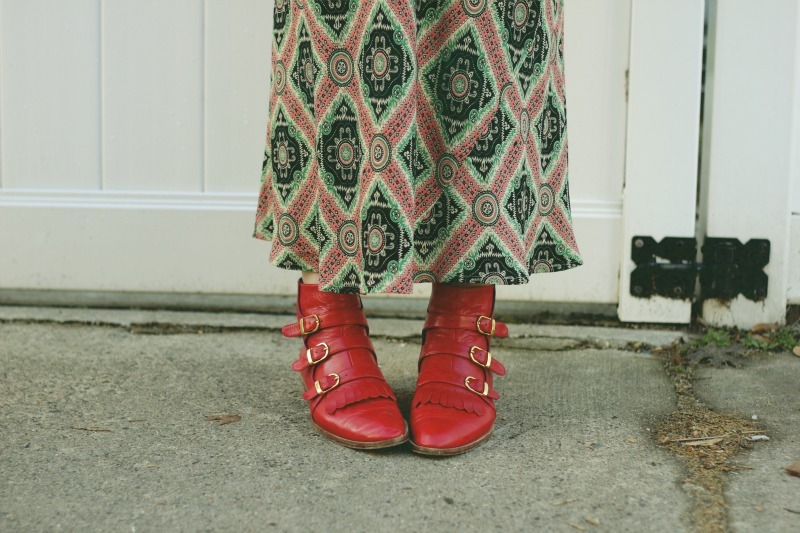 I am obsessed with the red Jett boots my sister and I designed in collaboration with Modern Vice, but was always a little precarious about wearing them out too often because they are VERY RED. And VERY DARING. But really, once you take them out for a stroll, you want to just keep doing it again. And again. And again. It's like a drug. But one that is actually good for you. Let's you explore your wilder side. Kick around in some red babes. You'll never go back too all that boring and plain ever again. And here it is again: THE JETT MESSENGER BAG!! Gorgeous, no???? I don't even know how I long I have had this skirt for. $2 vintage yard sale finds are THE BEST. This weekend has gone by so fast! Can't believe it's already Sunday. I passed out early Friday night (the work week can do that to a girl), but I was rejuvenated for a Saturday full of vintage warehouse browsing, wine and stout drinking, and shuffle board. But man, it was COLD. But hey, at the end of the day I made out like a bandit with some amazing spring dresses. Hopefully spring really will be just around the corner, because this weather is cray. I like your skirt and boots so much! Can't believe that the skirt was so cheap!? They give a hint of summer, at the same time. Love the skirt!!!!! so stuning! && don't forget rocking out to some awesome tunes. 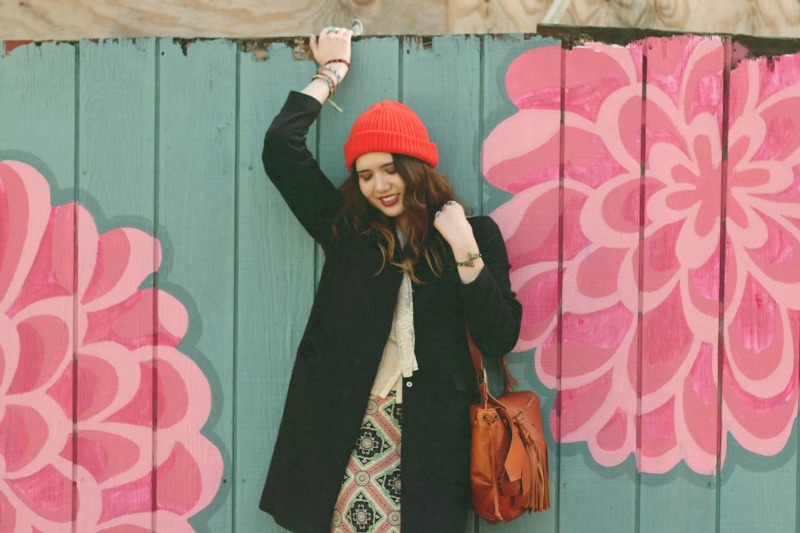 Yeah, I am that random girl that stopped you asking if you had a fashion blog. It was nice to meet you!! love love love the skirt? $2? Yes please! your bag is amazing!! :) Love it!! 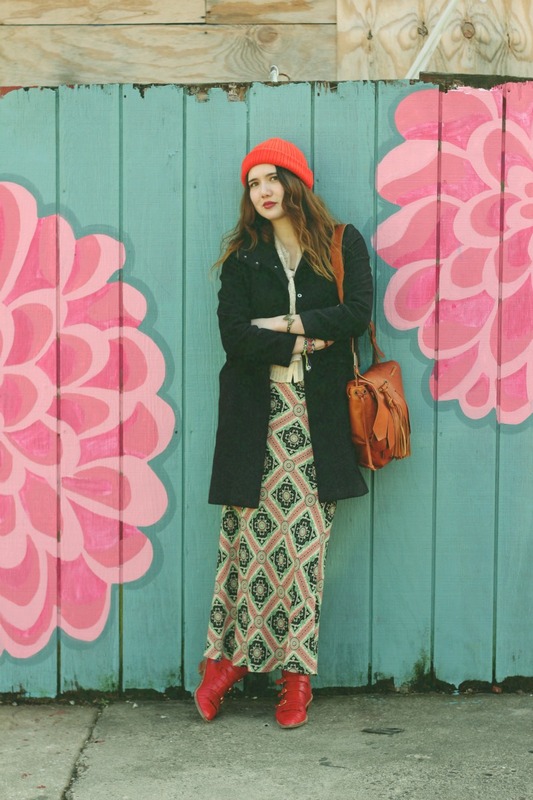 Love the free/boho spirit in this outfit, you always rock vintage prints like no one, Dy. Kisses from Venezuela. Love the skirt , booties & beanie, so cute. I love that skirt. A great thrift find is the best! OMG! I love your skirt! Fantastic blog! So wish I could afford the things in your modern vice collection especially those shoes! Great outfit! Im obsessed with you and your sister's modern vice collection! 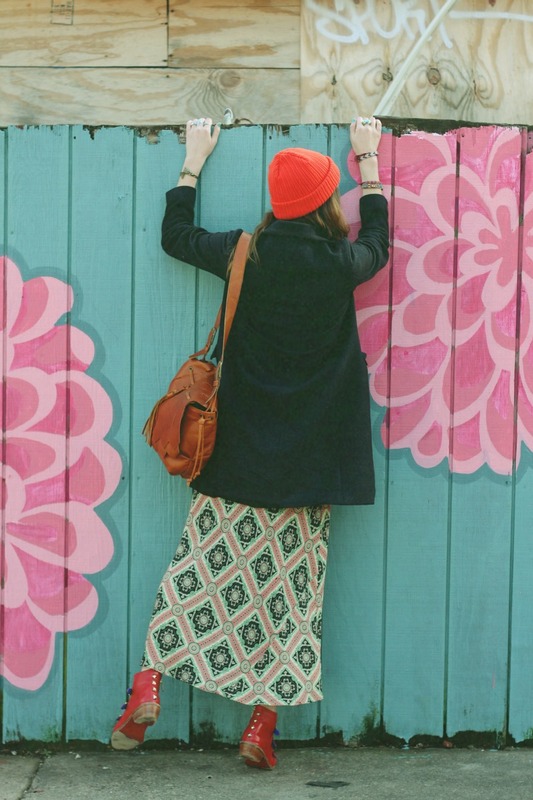 Btw, I love that fence, NoLibs has the best spots for photoshoots! Awesome outfit.. Great designer jackets..